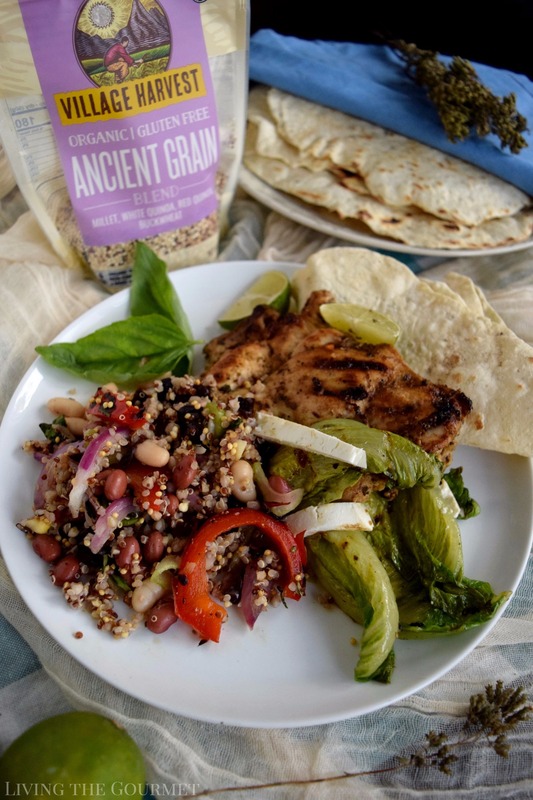 -Packed with protein, fiber, and nutrients, this Ancient Grains Three Bean Salad is served with Grilled Chicken for a hearty, healthy summer meal. That said, we’ve all heard the cliché that “Happiness is a choice,” well, perhaps or perhaps not, but certainly we can make conscious choices that lead in…well, in happiness’s general direction. A few afternoons back, I was at my desk and coming to the bottom of my espresso, I wasted no time in getting up for a refill. Turning out of my office to head downstairs, my eyes naturally deviated to the skylight opposite the balcony, as they always do, to catch a glimpse of the bay through the haze of tree limbs and tall beach grass, and watched as a pair of speedboats crisscrossed through the sunlit water. It wasn’t a particularly unusual scene, especially not for that time of day, but for some reason it caused me to stop and appreciate the view. Perhaps there was a hypnotic quality to watching the carefree lilting of the boats back and forth on through their own white crested waves, but as I made my way downstairs, I found myself in need something more than just another refill on my espresso. 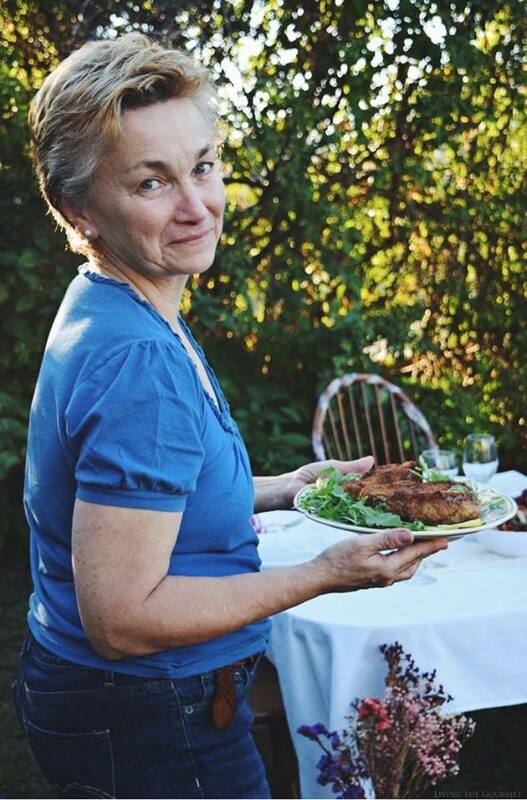 Instead, I decided that ‘Something Better Starts Here,’ and that I needed to partake in the season’s fair weather and sunlight – but of course, being who and what I am, my enjoyment would take a far more ‘culinary’ slant. 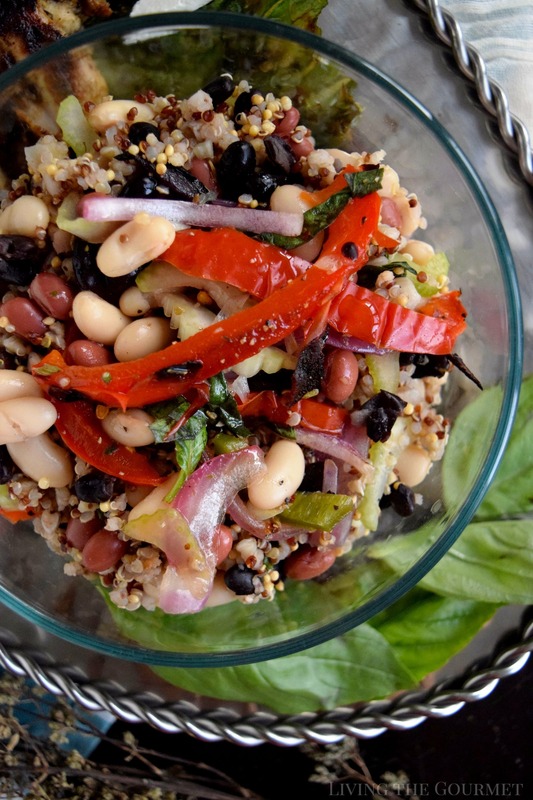 That being said, I’ll say that I do try to keep things as natural and organic as I can both here on Living the Gourmet, and that brings us rather nicely to today’s recipe – Ancient Grains Three Bean Salad. 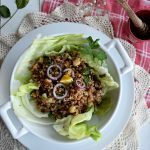 No, this isn’t a medley of tips on how to use barley or lentils that have been sitting in your fridge for a stint too long. 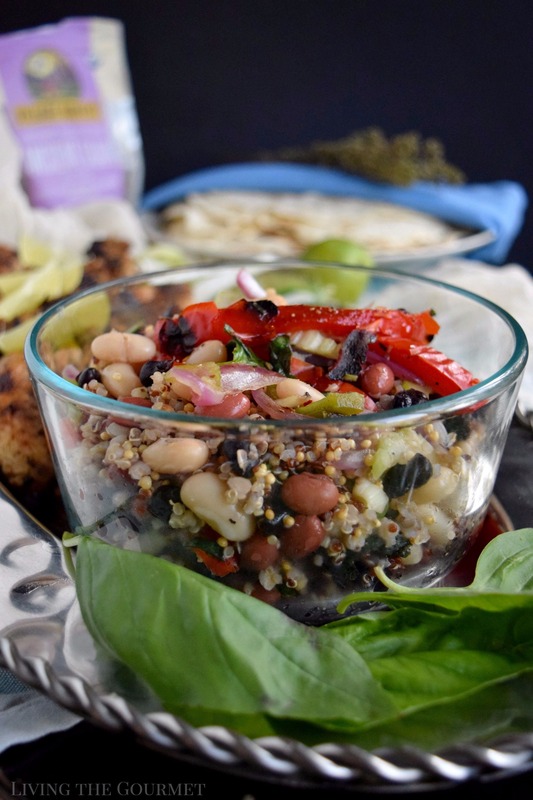 Instead, this is a bean salad prepared using Organic Ancient Grain Blend from Village Harvest, which is a sustainably sourced millet, white quinoa, red quinoa, and buckwheat, which are packed with a variety of nutrients as well as protein. Also available from Village Harvest’s Organic Benefit line is the Organic Antioxidant Blend and the Organic Protein Blend. 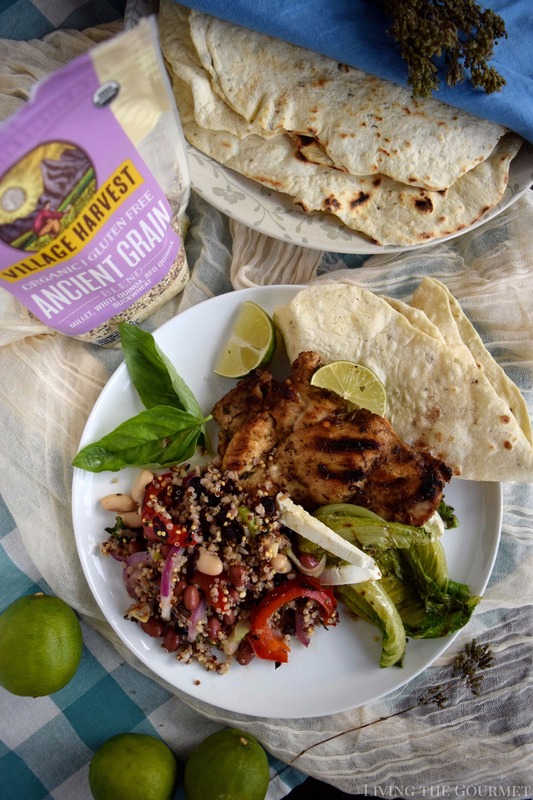 In addition to sustainably sourced organic products, Village Harvest has also pledged 1% of their profits to programs that give back to the farmers and local communities from which their products come, as well as 1% of their employees’ time to charitable causes and sustainability efforts. Now, to start things off…if you’re a regular reader of Living the Gourmet you can say it with me – Heat a Cast Iron Frying Pan. 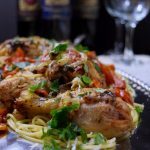 Once it’s nice and hot, place the garlic – in its skin – in the pan, along with a jalapeno, and a red bell pepper, and allow them to reach a nice char as pictured below. After that’s done pop the garlic from its skin, slice the bell pepper, and chop up the jalapeno, leaving the seeds if you prefer some extra kick, or scrapping them out if you prefer your food on the cooler side. I for one prefer the heat. Once that’s done, set all of that in a bowl with the celery and fresh basil, and combine that with the black beans, the red beans, and cannellini beans, along with some salt, pepper, red pepper, dried oregano, and a sliced grilled onion. After that, prepare the dressing as directed below. 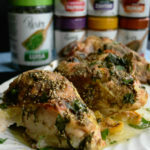 Once that’s done, prepare the marinade for the chicken thighs as directed below, and let the chicken thighs sit in the mixture for at least an hour, or preferably overnight. 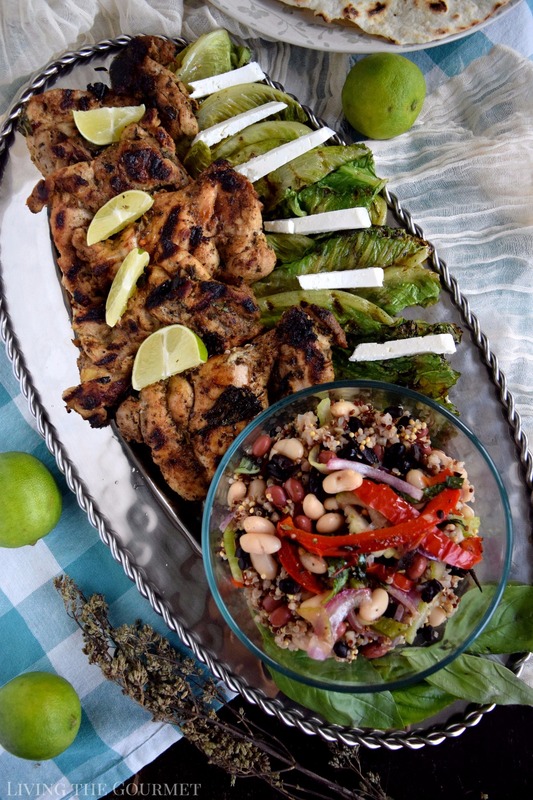 After that, grill the chicken thighs until they’ve reached a beautiful golden color and then serve with fresh flatbreads, grilled romaine, and some sliced feta as shown below, and who’s better than you? 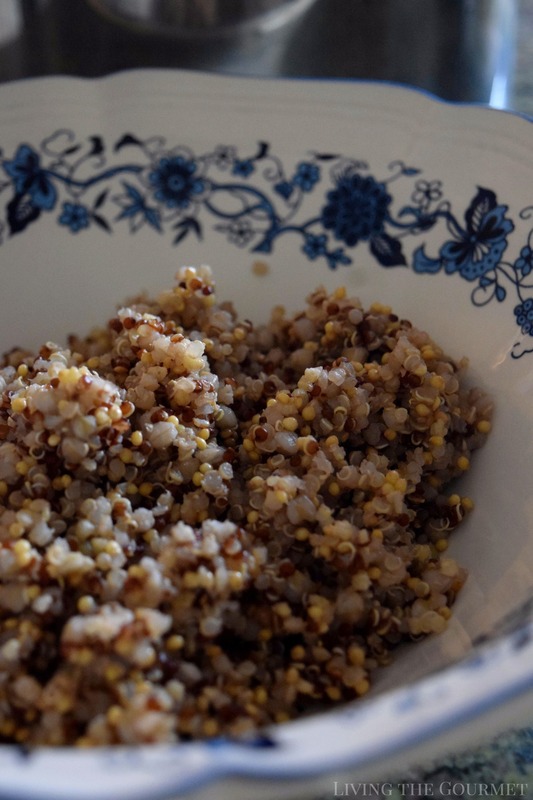 Prepare the Ancient Grains as directed and set aside. Heat a griddle or large cast iron frying pan and place the garlic in its skin, jalapeno, and bell pepper on the griddle to grill to a nice char. Keep an eye on the garlic so it does not burn. Allow to cool. Pop the garlic out of its skin, slice the bell pepper and chop the jalapeno with or without the seeds, depending on how much heat from the jalapeno you desire. Slice the onion and place the slices on the grill to get a gentle char. Place these vegetables in a bowl along with the chopped celery and fresh basil. Add the beans and give a gentle toss. 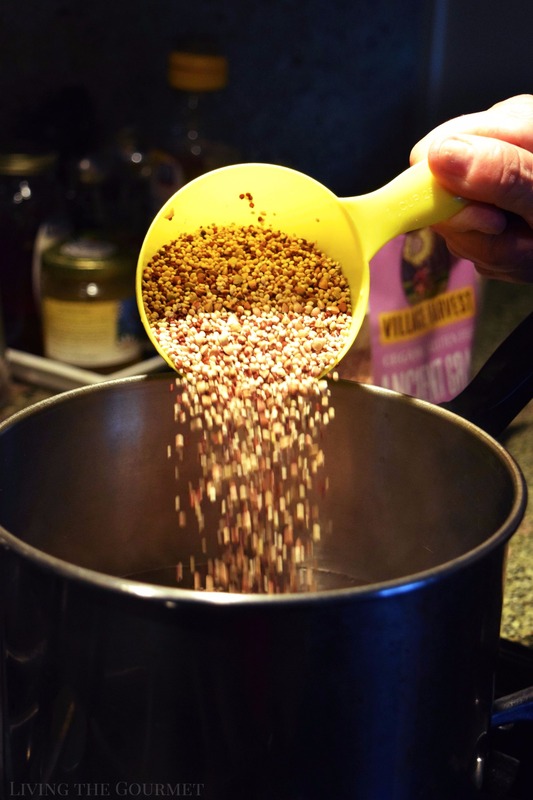 Add as much of the grains as desired and once again give a gentle toss. Spoon the dressing over the salad as it is served. 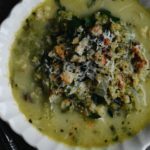 Combine all the ingredients for the dressing and stir. Add the chicken and refrigerate for at least one hour or up to overnight. Heat a cast iron griddle or large cast iron frying pan. Place the chicken on the griddle or in the pan over a medium heat. Do not over-crowd the pan. Cook for 4 – 5 minutes on each side or until the juices run clear. 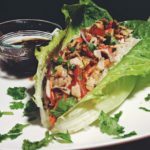 For a nice touch, grill Romaine lettuce leaves on the griddle by placing the leaves on the grill and placing a small cast iron pan on top of the leaves for about one minute. Drizzle with a little olive oil and a sprinkle of salt and black pepper. Serve with feta cheese wedges if desired. Try Village Harvest today! Don’t forget to fill out a Product Request Form for Village Harvest products. this look really delicious ! my kind of meal, Catherine. The chicken is so beautifully grilled. Oh, my. 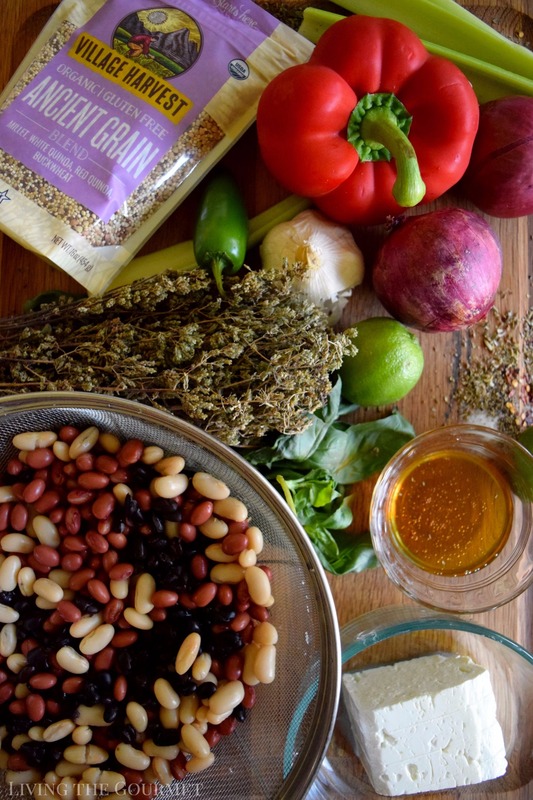 That Ancient Grains blend sounds marvelous! Perfect for so many summer salads!